Sometimes somebody’s adventurous spirit speaks to our own and stirs in us the desire to dream big. Maybe it’s because we know the same voice as they do: Not that of friends, family or society, but the inner voice that calls us to face our fears, test our physical and mental limits, and dare to live life to the fullest. Tonje Helene Blomseth is someone who stirs this voice within me. I’d like to introduce you to this adventurous soul and hope that her story inspires you to say yes to the next challenge that awaits you. Just over three months ago, on December 11, 2011, this blond, energetic, and very determined 17-year old achieved one of her goals. 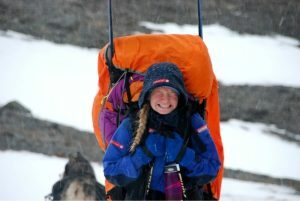 Tonje Helene Blomseth became the youngest person in the world to walk the length of Norway. 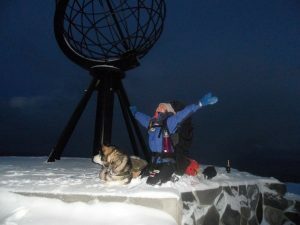 On June 26, accompanied by her faithful, fluffy Siberian Husky, Maddox, she left Lindesnes, Norway, and embarked on a 2,500 km (1,553 mile) journey. Destination: Nordkapp. As is often the case with big dreams, one can meet skepticism, whether it comes from strangers or loved ones. Some of Tonje’s friends thought the idea was foolish. And of course, for her family, it was a scary thought to let their daughter travel alone. However, once they saw she was serious and had sponsors for her trip, they too, gave her their support. She had seven to eight traveling companions that joined her for a few days along the journey, but for the most part she was alone with her own thoughts. Most adventures need an element of suspense, and Tonje’s trip is no exception. As she lay asleep one night, she was awakened by a sound outside of her tent. Maddox was standing on all fours, alert and intent on the deep breathing that resembled a sick person with a severe cough. A bear was investigating their campsite. Tonje called her mom, but within seconds her cell phone went dead. Crying and knowing she had nothing to defend herself with, this courageous girl lay still; ready to press her Satellite tracking device if things, in her words, “Got ugly.” Thankfully, she and Maddox were unharmed and can share about the scariest moment of their six-month trek. 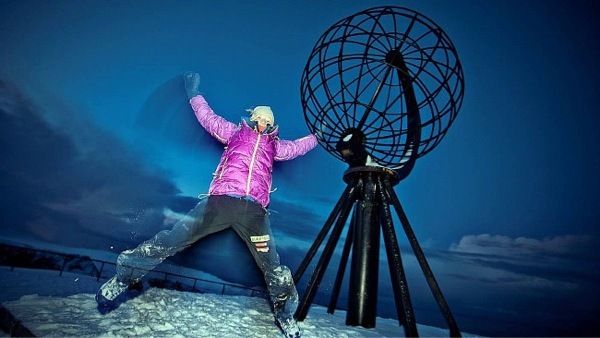 On December 11, 2011, Tonje Helene Blomsesth achieved her goal of being the youngest person to walk the length of Norway. 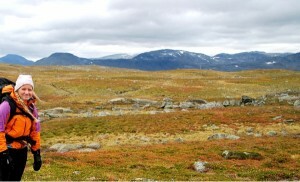 With mixed emotions she stood on the Nordkapp Plateau. Three months later, Tonje’s not slowing down. She just finished participating in the world’s northernmost sled dog race, Finnmarksløpet. And in April of 2013, she and a companion will be travelling to the group of Norwegian islands called Svalbard. 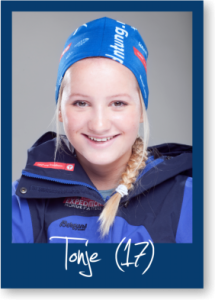 The determination of Tonje Helene Blomseth and her “Go-for-it” attitude are inspiring and contagious. I believe her journey is one worth following, and will no doubt challenge many adventurous spirits to take the leap and dream big! 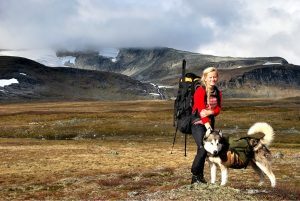 Tonje’s website is in Norwegian, but please check out the photos she posted during her journey. They’ll make you smile! Jentetur 250 mil. And if you want to follow the progression of her Svalbard trip, she and her traveling companion just started a facebook page and a website will soon follow (Svalbard Hoyt og Lavt – Svalbard High and Low.) All photos belong to Tonje Helene Blomseth and are used with permission. Wow, Unbelievable journey and Congratulations on completing it. I can imagine how scary it was with the bear. An AWESOME and POWERFUL story. The “bear part” is scary and that alone insures that I won’t be trying that “when I grow up!” CONGRATULATIONS to Tonje and BEST WISHES on her future endeavors. Yes, she’s one tough kid. I don’t think I’d do very well with a bear outside my tent. Congratulations to you Tonje! I am humbled as I read your story, as I can think of non as young, and obviously mature and courageous as you are to embark on a solo adventure, something, not many adults, let alone youths of today, would have the courage or strength to finish such an amazing journey. You certainly could serve as a role model for youth today. 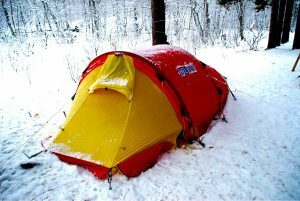 To face such obstacles like having a bear outside of your tent at night, afraid, you won! You persevered and kicked the heck out of your fears. And I can only imagine this was one of perhaps many, solo. I wish you all the best on your newest adventures and those to follow. I would be honored to follow you on your travels as I sense there will be more. A true inspiration for all. Excellent. Thank you for sharing. I agree, she’s an inspiration for all. She said she’s not sure she wants to be called a role model because of the responsibility it implies, but she is honored by the term. Thank you for sharing this amazing journey! I loved the way you used music and listened to different types as your mood changed…some for calming, some for uplifting, some just to keep you going. 🙂 Best of luck in your future adventures! Its very moving and inspiring to read about the courageous adventures of a 17 year old that many adults wouldn’t dare to try themselves! I have no doubt that she’ll go on to achieve bigger things. Nice story. I agree, her determination and fearlessness are inspiring. I’m glad more people can read about her, thanks to Bucket List Publications. Good luck with Svalbard … that place looks seriously beautiful! I know, 17! And now she just finished participating in a two-week long dog sled race. I’m inspired! Thank you to Leslie and Darren for publishing this article about Tonje on Bucket List Publications. I’m grateful that more people can read about this amazing girl. It was our pleasure to publish this article on Bucket List Publications. Tonje is an inspiration to us and we look forward to featuring further adventures and accomplishments like this. Thanks Leslie. One practical detail. The link to experiencenorthcape.wordpress.com doesn’t work at the bottom of the article. Are you able to fix that problem? Thanks for looking into it. What a fantastic story! I’m planning an 800 mile backpacking trip that’s rarely going to be far from the highways and civilization, and reading about this young lady doing twice that distance, mostly off road really settles all of my fears. If she can do it alone at 17 years of age, then I have no excuse haha! Good for her!!! Jim, I’m glad her story is an inspiration for you! I think your 800 mile backpacking trip sounds quite amazing as well. Where’s your traveling route? I wish you the best of luck on your adventure! Thank you Ekhaugli! I am marching from the front door of my home in Gardnerville, NV to the Space Needle in Seattle, WA. I’ll be blogging during my journey if you wish to follow along. Poked around on your blog and you got some great stuff going on! We all need a challenge if we want to feel alive. I’d rather take risks than live in a rut where the sides are so high I can’t see out. I aiming at 312 miles in 12 months around the Cornish Coast, which includes climbing more than the height of Everest twice. I’ve felt my blood vessels almost bursting, fallen, made dramatic errors of judgement but just love it. (Just 77 left to go now) I already have the next two trips in my mind. The best bits are when I’m totally alone, and don’t meet a soul or hours, I feel like I’m on a private adventure and everyone else is missing out. Sounds like an amazing adventure you are on! I wish you the best of luck on your last 77 miles to go! What an adventure, and good to read that she has continued. Reminds me of “A Walk Across America” by Peter Jenkins, which describes how the author walked across the States with an Alaskan Malamute dog. In one of the saddest parts of a book I’ve read, he writes about his dog being run over near the end of the walk, I do hope Maddox is OK though. This is absolutely amazing. I mean, for someone to be so determined to chase her dreams and fulfill it. That’s just great to read. Let this be a source of inspiration for all the other people who have big dreams, but lack the guts to chase them. Tough journey if you don’t like being alone. Well done Tonje. Thanks for sharing the story, Erica. Very inspiring for all of us, regardless of age, background, experience or dreams. There’s a dream in each of us that asks to be lived. Tonje is someone who knows how to listen to that voice and follow it. So can we all! Thank you, Julie and I couldn’t agree more. Erica, thank you for sharing this story. Tonje is a brave and adventurous little girl. I hope she never loses that spirit — and her faithful companion, Maddox, is the best friend on four legs that she could have. What an amazing girl! I understand she would not be afraid of travelling on her own because Norway is not the States not even most of the European countries where danger comes from other humans, but in Norway danger may come from wild animals, and she had the experience of a bad encounter with a bear. 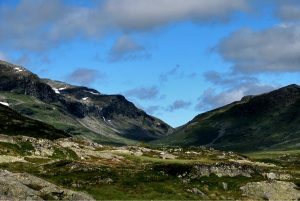 One month ago I was travelling in Norway, and we were not allowed to go to certains areas because of them. My God, she was brave! Awesome! WOW, what an inspiring adventure! She accomplished more at 17 than so many of us will ever achieve. Though I don’t see myself trekking the freezing plains of Norway any time soon, this is so motivating. Hmm, wonder where my next journey will lead?? Amazing story. I need to add to the story that Scandinavian people think differently when it comes to going alone to somewhere at an age what seems to be very young compared to the toughness and dangers of the journey. Scandinavian people let their kids go away alone at a young age who usually travel to the US or other countries after high school graduation. But still, hats off to this girl!